And he’s in bed with you. Did you know that E.B. White, the author of Charlotte's Web and Stuart Little, was a dachshund person? 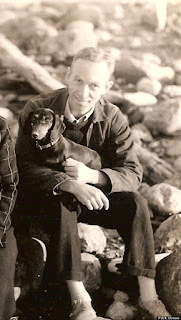 He first became aquainted with doxies because his wife, Katharine, was a great dachshund fancier. The Whites are pictured below with their dachshund, Minnie. Minnie is also pictured helping E.B. White write in the photo above. 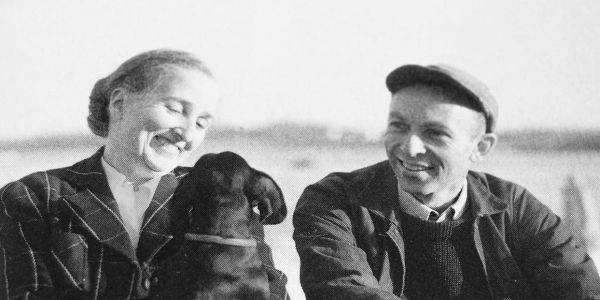 The Whites owned several dachshunds over the years, including Daisy, Minnie, Augie, and Fred. I have always loved dachshunds, and was delighted to learn that one of my favorite children's authors shared this affection. Do you love doxies, or is there another dog breed that has your heart? I would love to hear from you in the comments, below. Trish, I loved your E.B.White story. So interesting! I'm looking forward to reading your other new blog themes too. Well I didn't know that but I do now - thank you. My favourite dogs are King Charles Cavaliers, but really I like them all. Did not know. Nice to see something about the author. Thanks for sharing. 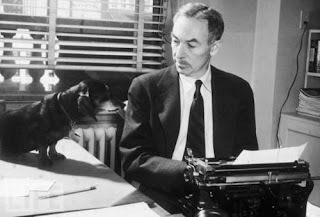 EB White spoke from experience! Love dachshunds, had two, but they do NOT care what we think. White's description of Fred and squirrels made me laugh. My late Sadie Mae would ripple her muscles and drool whenever she saw a squirrel. Bob - I remember Sadie at the window watching squirrels! Barney was that way, too, on walks. Such good taste in doggies! Fun read thanks Birdhouse Books! Thanks, MyMomsBooks! I appreciate your visit. The article about E. B. White was great. He's one of my favorites.